Nonprofit organizations face many challenges achieving its mission—obtaining funding, regulatory compliance, timely and accurate financial reporting, and a strong governance structure. With complex and ever-changing tax and audit compliance standards, nonprofit organizations need a team of professionals who can help navigate these challenges by providing specialized audit and tax services. Our tax and audit advisors for nonprofit organizations in Los Angeles, CA, have served nonprofit organizations since the inception of the firm. Our nonprofit clients range from large nonprofit organizations, including private non-operating and operating foundations, public charities, charitable remainder and lead trusts, to health and social welfare organizations. Additionally, we have an extensive practice dedicated to the affordable housing industry that includes nonprofit organizations. Our team supports many nonprofit organizations by providing time, talent and treasure to organizations in their communities. Many of us serve as members of nonprofit boards. We share our skills and experience to help these organizations achieve their mission. Our Community Service Committee plans events throughout the year that makes an impact in our communities. From packing boxes of food for at a food bank to cleaning beaches, building houses, clothing and book drives, we come together with purpose and commitment giving to those most in need. 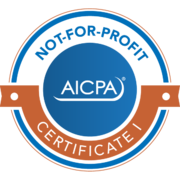 HCVT earns AICPA’s Not-for-Profit Certificate. This certificate requires a comprehensive, foundational understanding of a not-for-profit organizations' unique financial needs.